Many people take the gift of sight for granted. In fact, many do not know how important their eyes are and the necessary steps needed to take in order to keep them in the best shape. Your eyes are one of the most delicate parts of the body and should be kept in the best condition at all times. Your eyes need great care to keep them free from any abnormalities or complications. Eye problems arise due to many factors. Age is one of the commonly cited reasons for vision loss. Vision complications are common as you grow old and it is wise to start taking care of your eyes from a tender age. If any symptoms of eye complications are recognised, immediate treatment is necessary. There is a lot of talk on whether to opt for glasses or lenses dominates social platforms, as many people are concerned with keeping their eyes healthy. 1. An optician – Is an eye specialist who can prescribe the best eyeglasses. However, an optician may not be able to diagnose vision problems. 2. Ophthalmologist – Is a specialist who can diagnose an eye problem and treat it without any qualms. 3. Optometrist – Is an eye specialist who examines eyes, undertakes certain tests and can diagnose and treat the vision problem as per the examinations. You cannot just suspect an eye complication and think that you can walk into any eye institution and purchase a pair of glasses or contacts. You should at all times seek consultations, go through extensive eye screening and examination and learn about the possible treatment option available. You are not alone if you cannot differentiate between contact lenses and eyeglasses. Many people out there cannot tell the pros and cons of contacts and glasses. A contact lens or contact is a kind of thin lens that is carefully placed directly on the surface of the eye. Eyeglasses or simply spectacles or glasses on the other side are useful devices made up of glass or plastic lenses that are mounted in a frame to hold them firmly in front of the user’ eyes. Eyeglasses are used in most cases to improve vision whereas contact lenses can be used to correct vision for cosmetic purpose depending on the needs of the user. In essence, there is a lot that you need to know when it comes to contrasting contacts versus glasses. By comparing contacts lenses and eyeglasses, you will know the best device to go for and solve your eye complications. To gather robust information on these vision correction devices, you need to look at the pros and the cons of each device. From the information you gather, you will be able to deduce which device will solve your eye problem or that of a loved one. More so, you will be able to find reliable answers to questions like; are contact lenses better than glasses? Or what are the best contact lenses? If you live an active lifestyle, you need to try contact lenses as they come in unique designs and styles that will perfectly fit into your lifestyle. Contact lenses will make you feel in a way that you no longer have an eye problem. The lenses are inserted directly into your eye, which allows you to be able to move around doing your chores without any worries. Lenses perfectly conform to the curvature of your eye and will cause less vision distortion as you pursue your daily chores. As you look at the many advantages of contact lenses, you should keep the aesthetic value of this device in mind. Contacts help their wearers show off their style and personality. Colour contact lenses are available these days, and you can don them to alter the colour of your eyes to whichever you feel suits you best. Those looking for unique and attractive appearances can opt for custom contact lenses and switch up their style. When it comes to the aesthetic value of contacts, keep in mind that the designs you opt for will not clash with your dress code. They will perfectly go well with any attire you don. Contact lenses play great optical and functional roles. They are worn to provide improved peripheral vision. They also do not collect any moisture from rain or snow, and you can wear them without any worries. They are thus reliable when it comes to sports and many other outdoor activities. You can also use contact lens together with goggles, sunglasses and other devices as they are compatible with glasses. If you are still wondering, “what are contacts?” you will easily gather robust knowledge if you look at the different types these lenses in the market. Contact lenses come in varied styles that you will without a doubt fall in love with. They are mostly designed to solve varied vision problems. You can opt for disposable contacts, rigid gas permeable, toric contacts, conventional contact lenses as well as bifocal and multifocal contacts. When it comes to bifocal and multifocal lenses, you need to be cautious on your search. You will have to compare and contrast bifocal contacts vs glasses and go for a design that satisfies your needs. It is also wise to look at the multifocal contact lenses review pros and cons and know exactly the kind of contact lens to choose hassle free. If you are using contact lenses for the first time, there are risks associated with these eye devices. In most instances, contacts users can experience scrapes, infections as well as scratches when wearing them. Corneal infections are common among many people who wear them. Hence, you need to figure out the right way to wear your lenses. Many people cannot just wear contact lenses comfortably. Adapting to a new pair of contacts will require time for many people and extensive practice is also essential to stay accustomed to the lenses. You will have to practice how to insert and remove your lenses. Contact lenses require daily maintenance to keep them in the best condition and free from any dirt. Remember you have to insert these lenses into your eyes, so you have to keep them in tip-top condition. You have to clean and sanitize lenses before you can wear them and it can be a complicated procedure. As compared to normal glasses, contacts are more expensive to buy and maintain. You will also have to spend extra money in case of any adjustments needed or to get cleaning solutions. It is wise to compare the prices of the available designs and opt for cheap eye contacts. You can easily lose your lenses if they are not properly fitted or you are not the careful kind of contacts user. Unlike contact lenses, using glasses is easy as you just need to get a design that perfectly fits you. You don’t have to spend a fortune to purchase glasses. In addition, you don’t need to replace glasses on a regular basis. All you need is a clean piece of clothing to clean your glasses. It is also cheap to replace the glasses in case they get damaged. Eyeglasses present their users with a means to stay fashionable and create a style statement. All you need is to get an eyeglass design that can easily make a bold statement. There is a wide range of designer glasses to choose from. Eyeglasses wearers don’t have to worry about the risk of getting eye infection as they present users with less risk of touching your eyes. Glasses are useful in protecting users against the wind, debris and dust. Some people don’t like wearing glasses and feel they hide their facial beauty. Glasses can also lead to complications such as blurry vision especially if the wearer is using eyeglasses for the first time. It may be challenging to pick the best eyeglasses contact lenses if it’s your first time to wear them. Some glass designs come with frames that exert pressure on one’s nose and behind the ears. Such a situation may lead to headaches and general eye discomfort. Thanks to a large number of dealers offering exceptional contacts and eyeglasses designs, it is easy to make the right choice. Your personal preferences should make it easy for you to decide which is better contact lenses or glasses? More so, you should keep in mind the pros and cons that make contact lenses or eyeglasses stand out. If you are still wondering, should I wear contact lenses or glasses? Worry no more. Belson Opticians have the best eye solutions for you. They will help you decide on whether to choose glasses or contact lenses hassle free. They will not only provide you with robust information but also guide you get a design that will meet your needs. Great friendly staff, expert services, completely satisfied with the whole experience and it's nice not to be rushed in and out like the big chain stores. Highly recommended. First class professional service, all the staff are very courteous and helpful. Would heartily recommend Belson & Sons to all who expect the best in expertise and care. 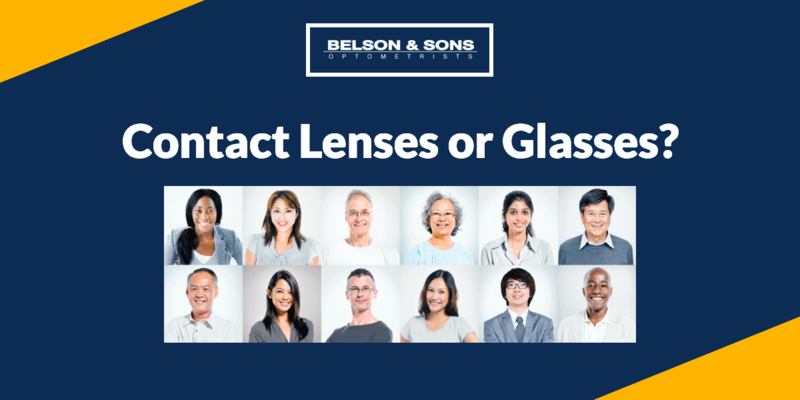 I have been using Belson & Sons for around 30+ years, the staff have always been polite, friendly and courteous; the opticians are very professional and thorough. I wouldn't go anywhere else. I have been going to Belson & Sons opticians for 21 years and I would recommend them to anyone who wants to see an optician. I have been using Belson & Sons Pitsea branch for years now and would not dream of changing. The examination is always thorough and the personal service is exceptional. I was always made to feel welcome, and felt as if every attention was being given to the care of my eyesight, unlike my (limited) experiences with some of the national chain opticians.